One of Canada’s largest automotive suppliers could step in to save the soon-to-be-shuttered GM Oshawa plant in Ontario. According to Automotive News Canada, Magna International is exploring the possibility of saving the beleaguered plant with a plan to assemble cars for different manufacturers on a contract basis. According to Magna CEO Don Walker, if the company is able to secure commitments from several automakers, the GM Oshawa plant could be the perfect place to execute the scheme, what with 2,600 workers and roughly 10 million square feet of available manufacturing space. Key word: if. “If we had four or five customers that said, ‘I’ll give you 20,000, 30,000, 40,000, 50,000 vehicles,’ and we got that up to 120,000 to 150,000 vehicles, then we could have a plant,” Walker said. The plan isn’t a new one to Magna, already the company’s Austrian arm, Magna Steyr, is contracted to build the new Toyota Supra and has previously built products for Jaguar, BMW, Mercedes, and Aston Martin. Ten years ago GM sunk $2 billion into upgrading Oshawa Assembly into a flexible manufacturing site that saw a distinct mix of products capable of being produced on the same assembly line. There’s even a modern paint shop that’s capable of accepting up to 27 different body styles, something that would be absolutely perfect for contract manufacturing. GM plans to end production of all products in Oshawa by the end of the year, a plan which will end 112 years of automobile production at Oshawa. 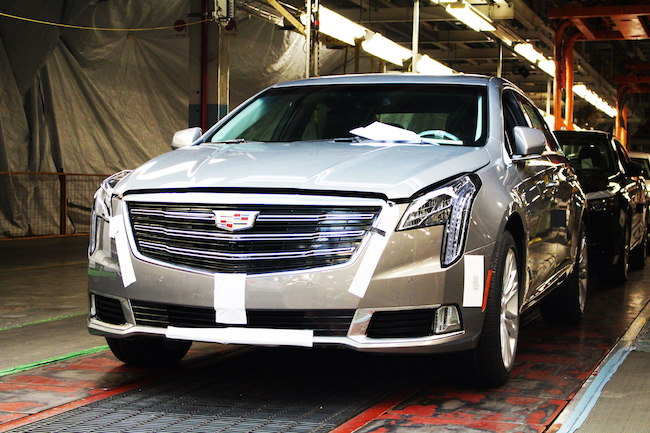 The plant currently is responsible for the Cadillac XTS, the Chevrolet Impala, along with final assembly of the previous generation Chevrolet Silverado and GMC Sierra full-size pickup trucks. Of course, even if Magna does secure the necessary contracts there’s no guarantee that the GM Oshawa plant will be saved, as Walker said the company would certainly consider Oshawa, but there’s also the potential to build a brand-new plant somewhere else in North America. Give them the plant and Unifor ASAP. Where is a Canadian made electric vehicle (EV) ….where is that Canadian that can bring people togather to make a fantastic EV ….we have the known how, the people, and now a plant to build it ….we need to get into the EV business and sell them to the world ….we have ….who can make it happen? GM leave the keys and walk away. Don’t forget to pay back the 11B you owe to the Canadian government. They don’t owe any money to the government. All loans from the bailout were paid back with interest. The government also took GM stock from the bailout that they have since divested themselves from. While the stock price at the time created a loss, it was the government’s choice to sell at that time since they did not want to be owning part of the new company for very long. Yes, there still was a cost to the taxpayers after the bailout was completed, but it was nowhere near $11B and the rest of it has likely been made back through income taxes of the GM workers who continued to have a job. Also, even though GM is closing the plant, 1,100 of those 2,700 workers are eligible for a full GM pension, and the other 1,600 could easily find work at other GM plants in Canada or take the offers of re-training put forth by Ontario Power Generation or Aecon. The situation, while not good for Ontario, is not as dire as the Union and people on social media have made it out to be. General Motors still owns the factory whether they continue to manufacture anything which means.. how much is Magma willing to spend to buy the Oshawa facility because General Motors isn’t willing to simply give it away for nothing. Musk bought the massive Freemont factory for a measly 40 million. Seems fair. Can a deal can be done if Magna co-manufactuer vehicles at Oshawa like the current GM/Navistar deal?. This would be a perfect opportunity for Magna to start building Opel vehicles here. That plant is big enough to manufacture multiple models from multiple brands. If Magna gets it, that’s exactly what they will do.